British Gas is to offer free electricity for eight hours at weekends to two million customers who have smart meters installed. Customers will be able to choose to use the free power either on Saturday or Sunday, between 9am and 5pm. British Gas said consumers should see savings of about £60 a year. But experts said it will not necessarily be the cheapest deal on the market, and advised people to shop around with other suppliers. Most of British Gas's 11 million customers will not be eligible immediately, as only 2.4 million of these currently have smart meters. 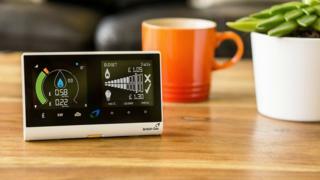 For the first time, smart meters enable energy firms to work out the time of day when people are using power. The move follows an announcement by British Gas in April that it had lost 224,000 customers in the first three months of 2016. British Gas said the new FreeTime tariff will be the cheapest dual fuel deal on offer from the company. But independent energy expert Ann Robinson said consumers can find lower tariffs elsewhere. "Consumers need to think about the small print, shop around and see if there's a better deal out there," she said. However, she welcomed the innovative use of smart meters, saying people might be prepared to change habits to save money. "It's worth thinking about cooking your major roasts and stews, or doing two or three rounds of laundry on the same day," she said. Experts expect other suppliers to follow suit. Large energy suppliers have now installed 2.75 million residential smart meters across the UK, less than 6% of all meters, according to the latest government figures. In total, 53 million smart meters are due to be installed by 2020. British Gas said it would install a smart meter for anyone who wanted to go on the new tariff, as long as they were eligible. Why are we using less energy than we used to?